Given a panoramic view of the city line, English Bay and Gulf Islands, the penthouses in Vancouver’s Cypress Mountain is indeed something everyone would like to see. We will be featuring a penthouse from this area with 4400 square feet. 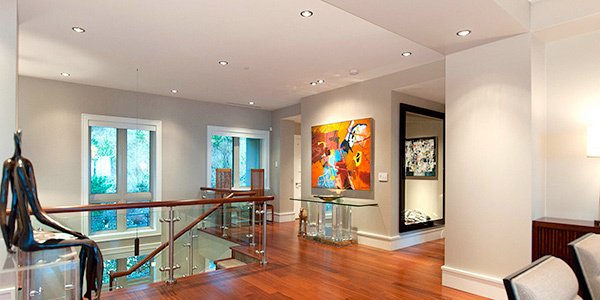 It has tall ceilings, walls of glass and custom finishes that made it look gorgeous. The interior and exterior design of the house are closely related in terms of color palette and materials. Rooms in the penthouse are open to a full terrace to connect it with the outdoors. 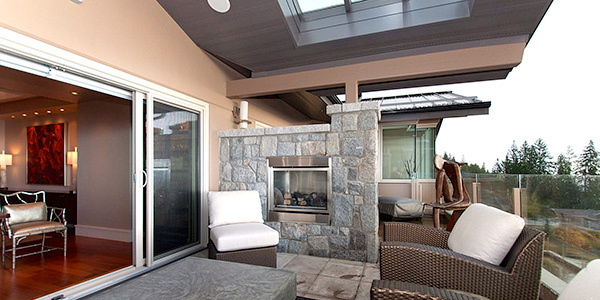 Outdoor terraces are equipped with fireplaces and entertaining areas. This give a great view of the outdoor scene like the waters and the sun. Seeing that makes this penthouse an amazing retreat for the owners. Now let us take a look at the design of the penthouse below so you will be able to appreciate its beauty even more. 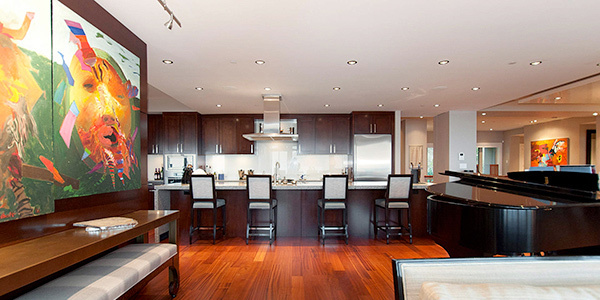 The penthouses that seats on the mountains of Vancouver is a stunning beauty with its contemporary and modern design. Another living room in the house which is more intimate than the other one but the color scheme is still the same. Part of the living room is this grand piano. You can also notice that the partition was used by placing a table and benches on it. In this picture you can see how spacious the interior is. It looks even wider with the use of lights and colors. The dining area looked lovely with the pendant light on top of it. 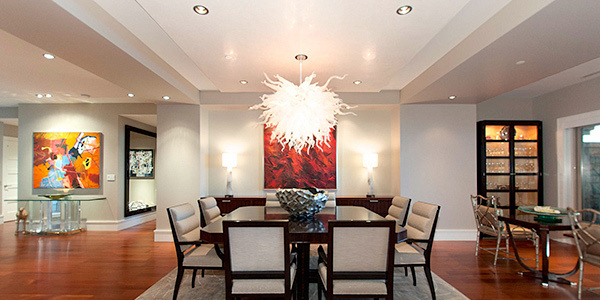 The contemporary dining set is a good choice for the space. 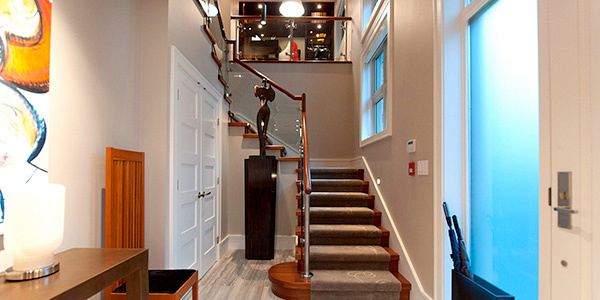 The stairs has railings from wood and glass which gives it a combination of contemporary and modern style. Wooden flooring is used for the entire home except for the wet areas, giving it a softer touch from nature. The decorations in the house sure are artistic. A bedroom with minimal furniture inside it using natural colors making it look serene. 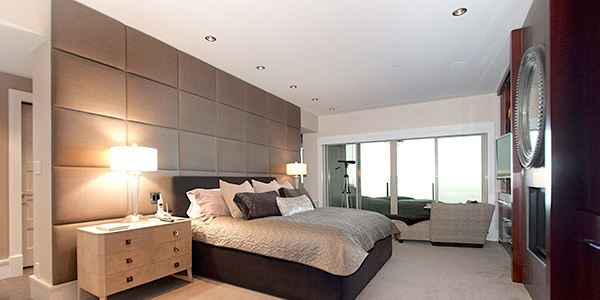 The master’s bedroom is simple but with the addition of the upholstered headboard, it looked sophisticated. The kitchen with bar is neatly done with wooden cabinets and furniture. You can see the numerous pin lights used to illuminate the area. This is indeed a spacious bathroom! 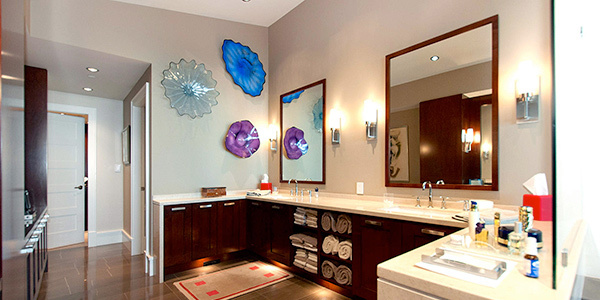 The vanity has wooden doors on it and white countertop. It also has subtle wall decorations to add life to the area. 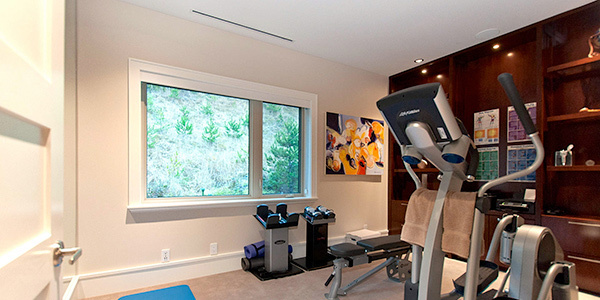 Getting fit is easier if a home has its own home gym like this one. The terrace could be one of the most favorite areas in the house because it allows them to get a good view of nature. Eight exclusive penthouses are found at Aerie II in West Vancouver and yes, this is the penthouse we are talking about. You have seen the interior that boasts a 16 feet vaulted ceiling making it look even more spacious. 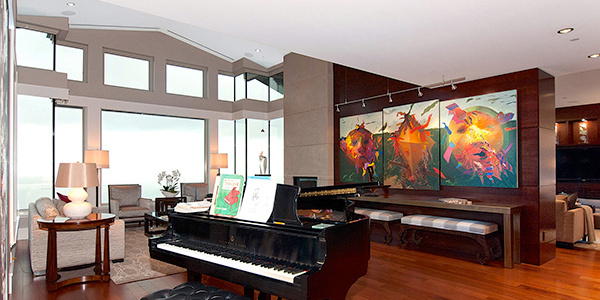 The West Coast Penthouse is indeed designed with intelligence and creativity in mind. Storage areas are well done to make sure that everything are well-kept from a hidden slide-out pantry wall to a walk-in closet. So, is this the kind of dwelling you dream of? Well, anyone would love to live this kind of place especially that it is not just complete with everything you need but it is also away from the noise of the busy city.